Michael Davies, lecturer, debater, columnist, and author of over 30 books and monographs on the changes in the Catholic church since the second Vatican Council, primarily concerning the liturgy, and is currently the president of Una Voce International. Born in Wales, a convert to Catholicism, Davies is a graduate of St. Mary's college in London and served in the British army before becoming a writer. He retired from a parochial school teaching position in 1995. Among his works are The Liturgical Revolution, a trilogy documenting the changes in the mass of the Roman church during and after the second Vatican Council (1962-65); Mass Facing the People; The Reign of Christ the King; Liturgical Shipwreck; A Short History of the Roman Mass and The Catholic Sanctuary. His public appearances have taken him to four continents. He appeared as a guest of William F. Buckley on "Firing Line" in 1980. The Catholic Sanctuary - $2.50 ea. Based on Father Adrian Fortescue's famous work "The Mass: A Study of the Roman Liturgy," this little book gives a compact history of the Roman Rite of the Mass from the Last Supper to the Traditional Mass ("Tridentine Mass") as it is said today. Michael Davies -- the foremost author in English of the changes in the Catholic liturgy -- explains the origin of the Low Mass, of Sacramentaries, of the Gallican and various other Western Rites, etc. He highlights the reforms of Pope St. Gregory the Great (590-604) and Pope St. Pius V (1566-1572), showing how neither "reform" produced a "new" liturgy; rather, the liturgical texts were always treated with reverence, and revisions were always minor. Michael Davies points out that "the very idea of composing a new order of Mass was and is totally alien to the whole Catholic ethos" and that "The Catholic tradition has been to hold fast to what has been handed down and look upon any novelty with the utmost suspicion." Yet this unbroken Catholic tradition was breached in 1970 when the Roman Mass was subjected to radical revision. The reader will come away from this book with a totally new appreciation for the "Tridentine Mass" as being our sacred and life-giving liturgical heritage -- passed down to us from Christian antiquity and intended to be passed on to all Catholic generations yet to come! 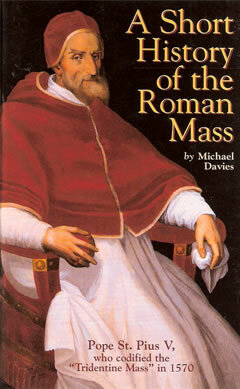 A Short History of the Roman Mass - $2.50 ea.